In July 1919, the Yugoslav delegation at the Paris Peace Conference received permission to occupy segments of two western counties of the Kingdom of Hungary: Vas/Železna and Zala. In early August 1919, Yugoslav forces therefore crossed the state border and acquired control over the Hungarian region, in line with the demarcation drawn in Paris. A year later, the Yugoslav territorial acquisition was confirmed by the Treaty of Trianon. Except for a short interruption during World War II, the area has since been under Slovene administrative control and officially recognized as Prekmurje (in Hungarian, Muravidék). Soon after Yugoslav forces crossed the border in early August 1919, the Slovene central executive in Ljubljana established an ad hoc office of civil commissioner in charge of public administration in Prekmurje. The commissioner, who had his office in Murska Sobota (in Hungarian, Muraszombat), was subordinate to the Slovene Provincial Government in Ljubljana, which retained exclusive authority to assign and dismiss officials in the region. Unsurprisingly, the government began replacing Hungarian administrators with Slovene ones immediately after the occupation, transferring the latter from their posts in the former Cisleithanian crownlands to Prekmurje. At the same time, the Slovene government in Ljubljana began sending experts to the occupied territory in order to gather information on social, cultural and political circumstances in the region. Lacking reliable and verifiable information, Slovene politicians and public servants who worked in Ljubljana sought precise observations about the state of affairs in the region. Prekmurje was, after all, without a direct railway connection to other Slovene territories; as such, it was a very remote and almost inaccessible area far to the east of the national heartland. About a month after the occupation, the Higher School Council in Ljubljana, the leading administrative body responsible for the school network under the control of the Slovene Provincial Government, sent Franjo Cvetko to Prekmurje. Cvetko, a head teacher from the neighboring East Styrian village of Vučja vas, departed on a mission to assess the existing situation and report in detail on the organization of the school network in the region. In a series of documents dispatched to Ljubljana in the following weeks, Cvetko meticulously described the cultural circumstances and social conditions in local schools and evaluated the competence of the existing teaching staff. In addition, he suggested the measures that should be taken in Prekmurje’s schools, focusing first and foremost on the language of instruction. Given that in autumn 1918, the Slovene language was declared the official language of the territory under the control of the Slovene government, Cvetko proposed an immediate dismissal of teachers who were fluent only in Hungarian or German and their replacement with Slovene speakers from the former Cisleithania. His proposal was certainly quite typical in a post-1918 Central European transitional period marked by the triumph of the “principle of nationality.” It also corresponded with the prevalent discourse spread by Slovene politicians, national activists and journalists, living in the recently established Kingdom of Serbs, Croats and Slovenes, who described the annexation of Prekmurje as a redemption of Slovene brothers who had suffered for centuries under the Hungarian yoke. What is much more surprising, however, is Cvetko’s attitude towards the local literary Slavic language, which was traditionally used as an unofficial auxiliary language of instruction in several elementary schools in Prekmurje. Cvetko claimed that this local Slovene should be prohibited in schools as well. Instead, the official Slovene national (standard) literary language should be the exclusive language of instruction in Prekmurje. However, such a linguistic transformation could only happen if the local Slavophone teachers, fluent in the local Slovene but with a very limited knowledge of standard literary Slovene, improved their poor language skills. A cohort of “native” local Slovene teachers should, Cvetko concluded, take courses in the standard Slovene national language and pass the test of fluency to continue teaching in Prekmurje elementary schools. To his meticulously written assessment of school affairs in Prekmurje, Cvetko attached a spreadsheet that provided the civil servants in Ljubljana with a condensed and multifaceted overview of his findings and recommendations. In this document, the future path of Prekmurje teachers— the implicit common theme of the whole report—came to the fore in an unambiguous way. Starting with the school network’s organizational dimension, Cvetko listed school locations in the first column of the spreadsheet, thus delivering an insight into the territorial dispersion of schools. The second column of the report revealed the founders and financial backers of every single elementary school. In 1919, schools in Prekmurje were financed by the municipalities, by churches (Catholic and Protestant) or by the state itself. The third column defined the number of grades. Schools had between one and four grades, the exception being the state school in Murska Sobota (Muraszombat), with five grades. The fourth column of the report focused on school attendance. On average, each school was attended by a few hundred pupils, with only 50 enrolled in Predanovci (Rónafő) and as many as 520 in Turnišče (Bántornya). In the following column, the headmaster listed all the employed teachers: in autumn 1919, there were 124 in total in Prekmurje. In the next column, these teachers were categorized according to their “nationality.” The spreadsheet reveals that Cvetko labeled the majority of teachers either as Hungarians (59) or as Slovenes (57), but there were also four Slovaks, two Germans, a Serb and a “Hungarian Serb” who taught in the region. The last two columns, however, comprised the most interesting data, for they somehow sealed the destiny of the existing teaching staff. The penultimate column described each teacher’s “knowledge of Slovene.” Only six of the 59 teachers categorized as Hungarians were considered to be qualified in Slovene. Beside 53 Hungarians, five Slovene teachers and one German teacher were also evaluated as being incapable to speak Slovene. Interestingly enough, the Slovak and Serbian teachers’ knowledge of Slovene proved to be sufficient, which was also true in the case of one German teacher. Cvetko’s overview of the local schools ended with a column euphemistically titled “Suggestions” or “Remarks.” In this column, Cvetko “suggested” or “remarked” that teachers capable of communicating in the Slovene language—regardless of their nationality—should keep their posts, while all those with an insufficient command of Slovene should simply be dismissed. On October 30 1919, the Higher School Council issued the decree that put an end to the period of uncertainty and conclusively regulated the question of language in Prekmurje schools. It seems that a decision of civil servants in Ljubljana somehow reflected the linguistic reality on the ground. The decree unsurprisingly proclaimed standard literary Slovene as the language of instruction in all Prekmurje schools, where supposed Slovenes represented the majority of enrolled pupils. Yet the officials also left the door open for necessary compromises. In those schools where teaching in the Slovene national language was not possible due to a lack of appropriate teaching staff, the decree allowed the use of “Prekmurje Slovene” or the “dialect of Prekmurje.” Still, the pupils educated in schools where local Slovene was used were expected to acquire a satisfactory level of knowledge in standard Slovene pronunciation, writing and reading by the time they finished their schooling. The decree also made standard Slovene a compulsory course in places where the population was prevailingly Hungarian and/or German and hence the language of instruction was either Hungarian or German. The text summarizes part of the argument presented in the article “Slovene Ethnolinguistic Nationalism as Rhetoric and Practice in Post-Imperial School Administration in Prekmurje” (Spiegelungen. Zeitschrift für deutsche Kultur und Geschichte Südosteuropas;forthcoming). 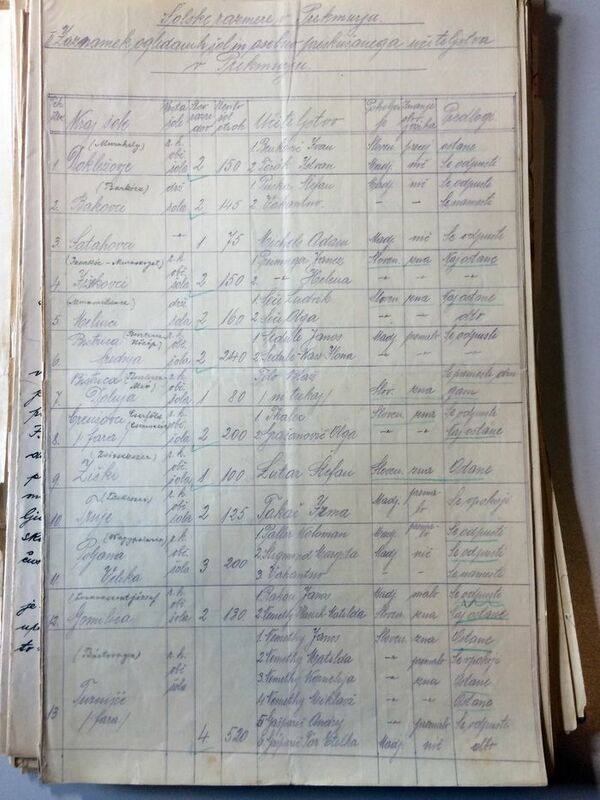 “Šolske razmere v Prekmurju [School conditions in Prekmurje]” (hereafter School conditions) in The Archives of the Republic of Slovenia (hereafter ARS); SI AS 53, 20; Prekmurje 20/49, Višji šolski svet v Ljubljani [Higher school council in Ljubljana] (hereafter Prekmurje 20/49).